If I told you I was a ‘bag lady’ does a dear old woman pushing a rusty shopping trolley, full of her dearest belongings, come to mind? Or would you infer from this label that I am a girl who avidly loves her handbags? Especially her new Spring Radley bag and purse. If I told you I was a ‘bag lady’ does a dear old woman pushing an rusty shopping trolley, full of her dearest belongings, come to mind? For the last few years I have been an Orla Kiely fan I own quite a few of her bags, my favourite being a bright yellow vinyl number, that you have probably seen in many of my pics? However this year I am tiring of the vinyl and have a yearning to feel and smell leather again. I adore the smell of leather, don’t you? 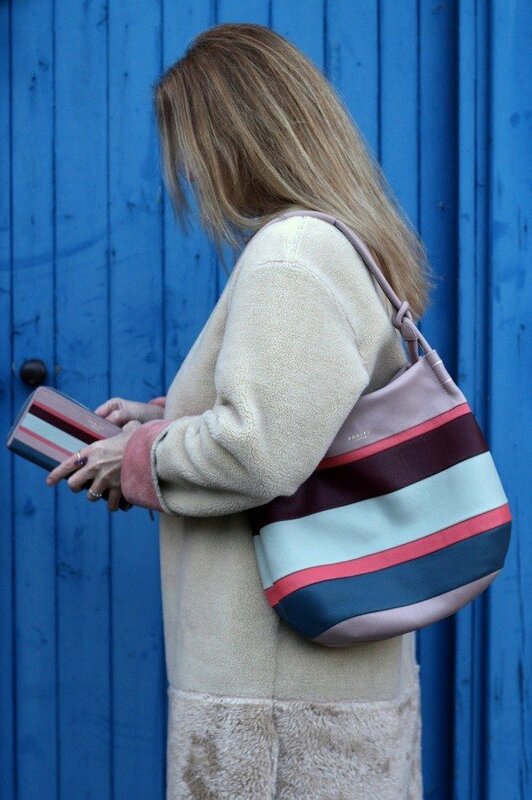 The Radley brand have been on my ‘bag lady’ radar this year, all due to the stripe factor. Stripes are a classic, but I prefer to look at them rather than wear them. When you have absolutely no waist line to speak of, like me, then stripes are not your best friend. So speaking from a personal point of view I find they make me look wider than I actually am. So from now on you will be seeing far less of orla and oh so much more of Radley. If you are an ardent colour lover, like myself then I am sure you will agree those colours go together like tea and cake? Wren Street large Scoop Hobo Bag. PS: The ‘sparkle’ I will write about in my next post…so watch this space? Maybe think about signing up in the form below to receive every post straight to your inbox? Then you won’t miss a thing! This beautiful Radley bag and matching purse was very generously gifted to me. However this does not alter my opinion in anyway whatsoever! I am lovin your blog Ashley! Love all yr boots and love yr new bag and purse! Best wishes from one bag lady to another! Thank you, bags and shoes eh what is it about them that makes us happy? So pleased you approve and so lovely to have you comment on here too! Such a chic, modern, street-style look. 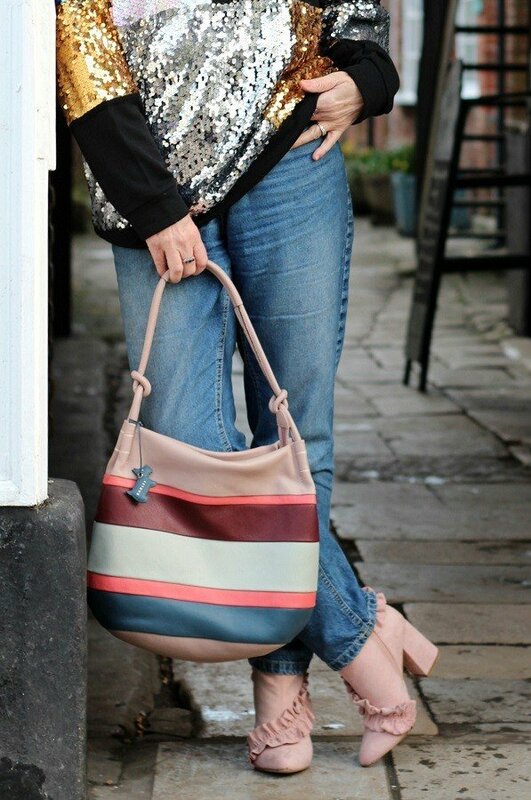 That sequined colorful top is gorgeous and you always style jeans so well, Ashley. Did you see that I featured you last week (March 8th) on Thursday Moda with your stunning floral maxi dress and red booties?! Oh wow thank you I missed that one! I will have a look right now! 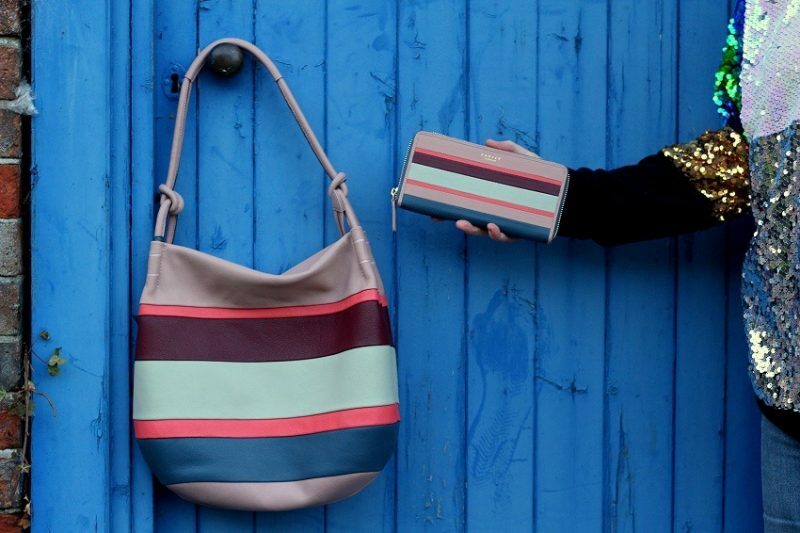 Those stripes definitely make it a modern and fun purse!! Besides, wearing it with those incredible boots just add so many smiles!! You are right Jodie those boots make me smile everytime I see them! You chose well my friend! 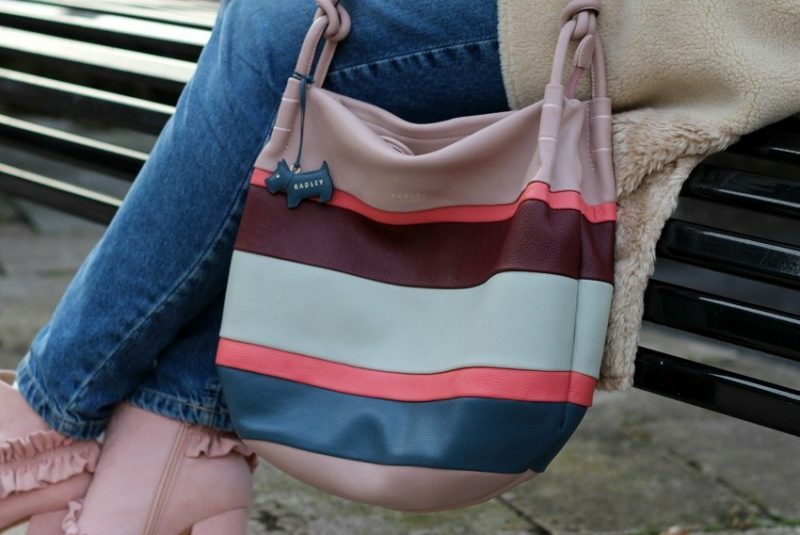 Love the Radley brand at the mo. 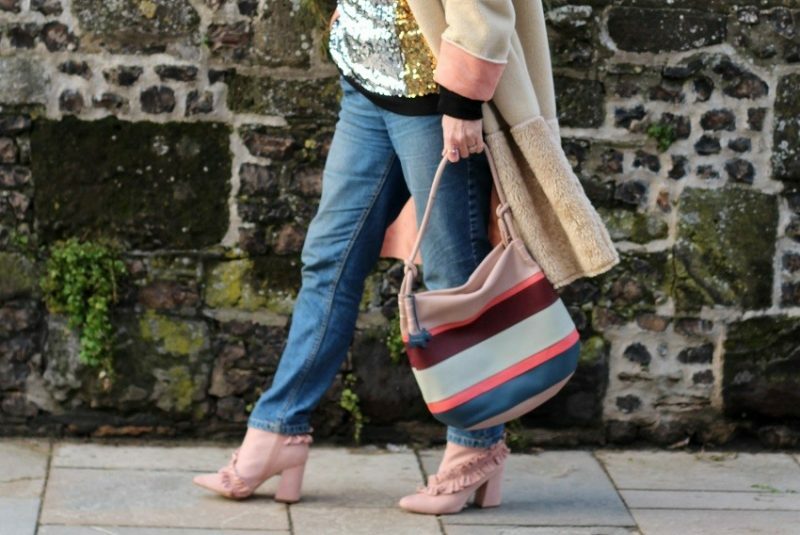 Loving the sequins too! Thanks Laurie, Ill have it with me next time we meet up! 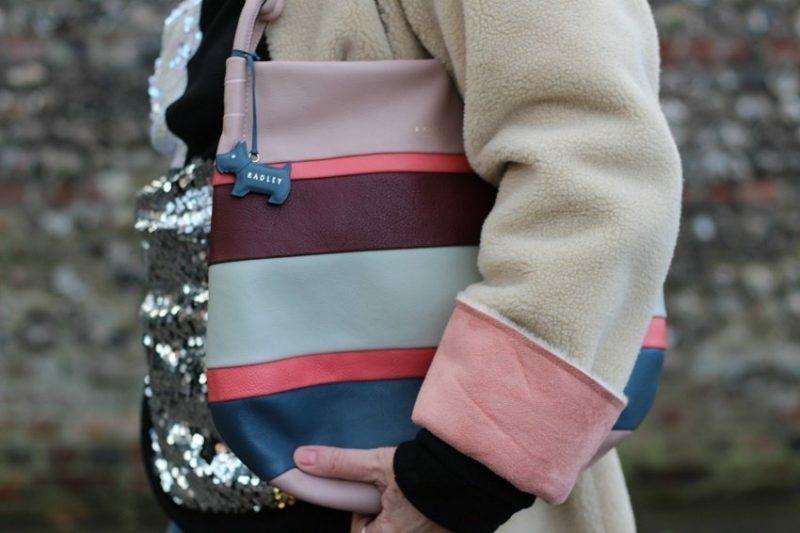 I too think the colours are subtly pretty, a handbag needs to go with lots of things, so too bright would not work even for summer I agree! In rel life the colours are even prettier! 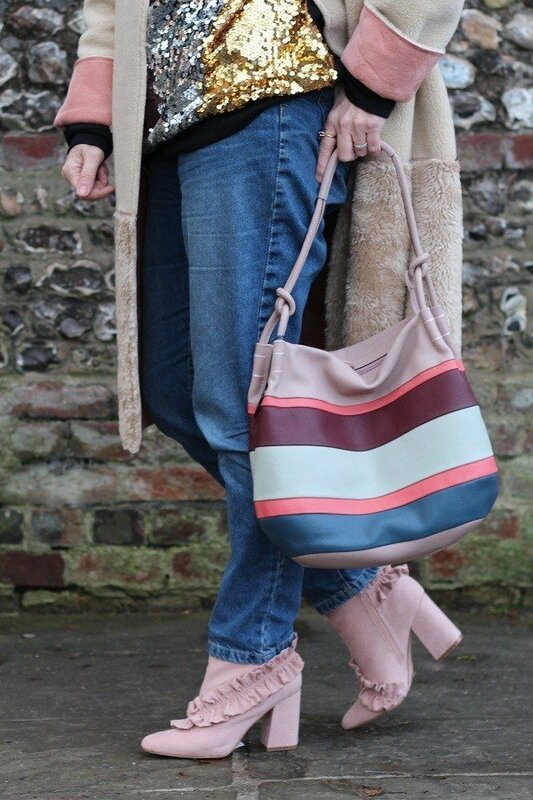 That bag looks great on you Ashley, I love the colours as they are soft and subtle and not in your face. Have a great Mother’s Day.